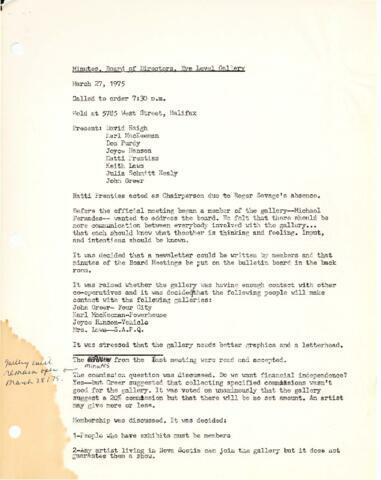 Item is typed meeting minutes of the Board of Directors at Eye Level Galley which happened on March 27, 1975 at 5785 West Street in Halifax. This meeting had David Haigh, Karl MacKeeman, Don Purdy, Joyce Hanson, Hatti Pretniss, Ketih Laws, Julia Schmitt Healy and John Greer present. During the meeting Michael Fernandes brought up communication issues regarding the lack of input and intentions between the gallery and its members. Other topics of conversation included funding, the roles of the board, becoming non-profit, and membership exhibitions. Item is typed on acidic paper, with large stain on the bottom left corner.